Jurupa Valley, CA. | CAL FIRE/Riverside, Riverside County Fire and Riverside City Fire firefighters were dispatched to an area near Van Buren Boulevard and Clay Street in the Santa Ana Riverbottom of the Jurupa Valley community. The call was for two brush fires burning in a single area. The fire was reported on the afternoon of Saturday, January 26, 2019, around 1423 PST. The two fires, one acre in size each were said to be holding in a three-acre area in heavy fire fuels. Crews were in extensive mop-up operations and due to remain on the fire ground an additional four hours (around 1915 hours PST). There was about 85 firefighters from CAL FIRE’s Riverside division, along with Riverside County FD and Riverside City FD that joined into the battle of the two fires. Additionally, there were 13 fire engine companies (Type 3 engines) , two hand crews, two dozers and three overhead personnel assigned to this incident. An air attack was also deployed. There is currently no known cause released. The BOX FIRE is burning on NB I-5 at Kenwood Avenue that started as a car fire into an urban interface on Friday, July 6, 2018, around 0955 hours. The fire has scorched 100 acres of grass and chaparral fire fuels. Weather concerns are continued near record high temps and low RH percentages. There are a total of 105 personnel from the CAL FIRE – Inyo-Mono-San Bernardino Unit, San Bernardino County FD and San Bernardino National Forest are attached to this incident will continue to monitor for embers and hot spots. Other resources include those from the CHP, San Bernardino County OEM nd the San Bernardino County Sheriff’s Office. The fire has reached a 50% containment status. The COUNTY FIRE is burning in CAL FIRE’s Sonoma-Lake Napa (Napa and Yolo Counties) Unit’s area. The fire is being managed by a CAL FIRE IMT Type 1 that was formerly managing the PAWNEE FIRE. This fire is burning one mile southwest of Guninda and east of Lake Berryessa, California. Fire fuels include brush. Current fire behavior is active with uphill runs, flanking and backing. Many structures are being threatened. Evacuations, roads, area and trail closures in effect. 88,425 acres. 55% containment reached. 2,858 personnel. 61 crews. 176 engines. 23 helicopters, 48 bulldozers and 51 water tenders. Mandatory orders have been lifted as of 2111 hours PDT. For evacuation information, visit the Napa County Sheriff’s Office for details. Incident Cooperators include – California Department of Corrections and Rehabilitation, Cal OES, California Highway Patrol, California Conservation Corps, Yolo County OES, Yolo County Sheriff, Solano County Sheriff, Napa County Sheriff, PG&E, Bureau of Indian Affairs, Yocha Dehe Wintun Nation, Bureau of Land Management, United States Forest Service, California Air National Guard and California National Guard. 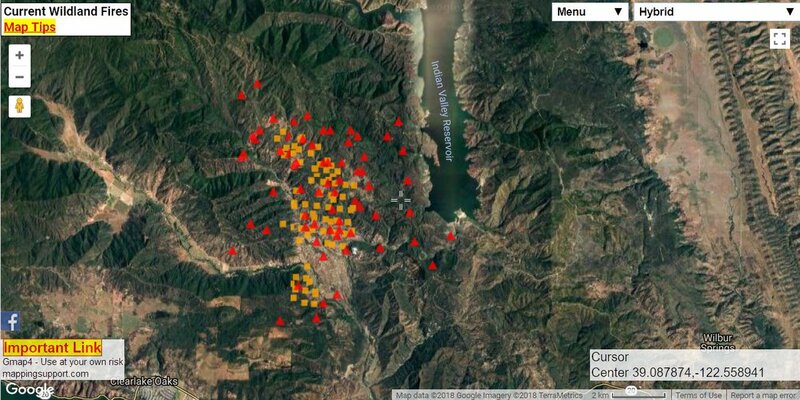 There is a conflicting report that 18 structures have been lost (NIFC) and 10 via CALFIRE’s presser. Fire suppression and containment status reaching an all-time high of $27,500,000. Public Resources – Dial 2-1-1 for Yolo County evacuations or advisories ; Text 888777 for updates for Napa County residents. ; 707- 967-4207 for County Fire Information. CAL FIRE crews were dispatched to a brush fire near 40 Dutzel Lane in Cherokee around 1530 hours this afternoon. AA 210 were overhead reporting the fire to be about two to three acres with a structure involved. Three additional engines were requested with CAL FIRE’s TGU unit and a dozer from the Plumas National Forest en route. According to a timeline, the IC requested five additional engines due to the wind shifting and three additional structures at 1537 hours. Oroville FD was dispatched and responding as mutual aid to the fire. Tankers 88 and 89 were inbound from the Grass Valley area at 1549 hours. About ten minutes later, the forward progress was stopped with the dozer going back in service. Tankers were were available but would be eventually released. Water tenders were requested to continue with responding, however all other incoming engines and additional dozer were CODE GREENed. All-in-all, the total amount of acres scorched was four with one shed, car and trailed being destroyed. The GOOD NEWS is that firefighters saved many, many structures. Today, at noon the EAST CREEK FIRE was reported to fire officials of a fire burning in the Kings Canyon Wilderness located south of the Bubbs Creek Trail and west of the East Creek Trail or about 8.5 miles east of Roads End Permit Station. It is said to be burning 8,700 feet in a stand of Red Fir. The cause is unknown and under investigation. The total acreage burned so far is 10 acres of timber with a 0% containment status. Due to the remote location, there are no threats to property or people in the area. However, there is some potential for fire growth which fire crews are working to contain as quickly as possible. There are 15 personnel assigned to this incident. 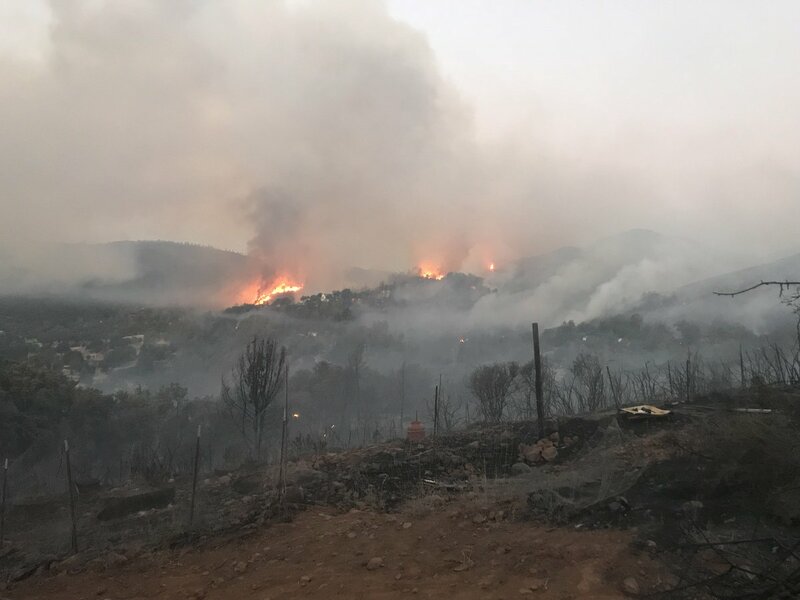 CAL FIRE and Santa Barbara County fire personnel were battling a 35-acre wildfire on July 6th around 2345 hours PDT off of north Fairview Avenue and Holiday Hill Road in the City of Goleta (Santa Barbara County). Mandatory evacuations of these are areas are still in effect Sunset Ridge Road, Franklin Ranch Road, North parts of La Goleta Road, north Fairview, north of La Goleta Road, El Camino Ratel, Holiday Hill Road, Villa Lemora, Cuesta Verde, Edward Place and Pine Tree Lane. Red Cross Shelter –> 5769 Hollister Road. San Bernardino County Sheriff’s Office Deputies spotted a drone over theGoleta Valley Junior HS. This will undoubtedly cause all aviation fire resources to shutdown until the airspace has been cleared. DON’T DO IT! #NoDronesInFireZones period. The fire was said to have started on the same day around 2040 hours. Today, it is at 100 acres and with an 80% containment status. 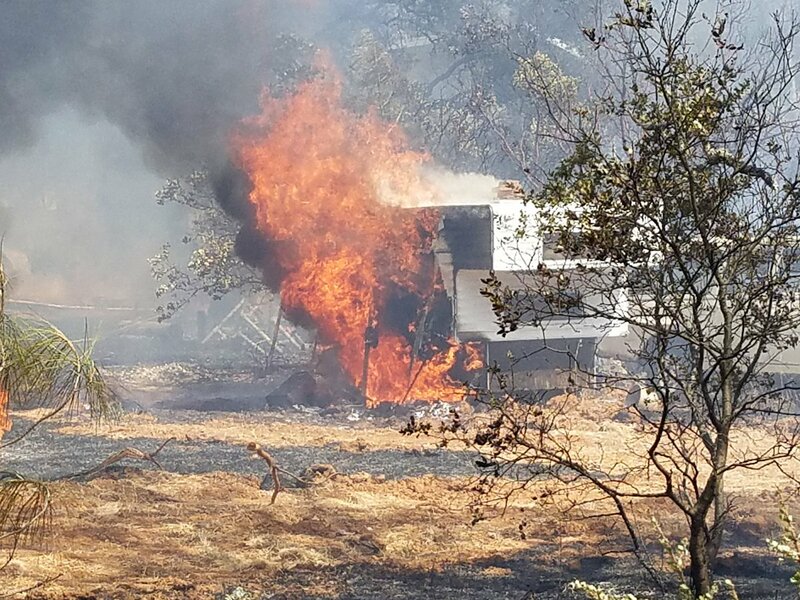 The KLAMATHON FIRE is burning about two miles southeast of Hornbrook in CAL FIRE’s Siskiyou Unit’s service area in timber, chaparral and tall grass. Fire behavior is extreme with short crown runs and running. Communications infrastructure in several areas are currently being threatened. Evacuations and road closures are in effect. 9,600 acres with a 5% containment status. 572 personne along with 18 crews, 61 engines, 8 helicopters are assigned. 40 structures have been lost with costs-to-date of $1,000,000. The LIONS FIRE is burning in the Sierra National Forest without a Type 1 or Type 2 IMT that has scorched 4,064 acres. The fire cause was lightning that ignited the area on Monday, June 11th around noon about seven miles southwest of the Mammonth Lakes area. It has an 84% containment status. 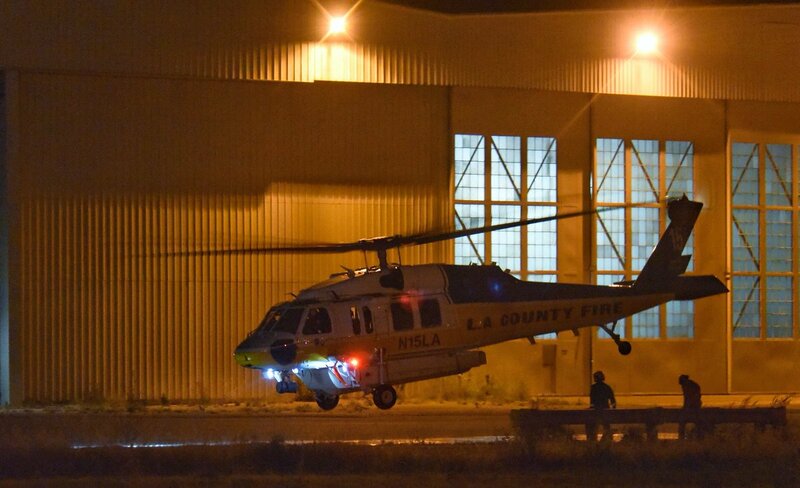 There are 174 personnel, four crews and four helicopters. Cost-to-date has reached $4,300,000. The MARILYN WILDFIRE is located in the 29300 block of Marilyn Drive where fire crews were dispatched at 1928 hours. IC P17 on-scene. No further details available. The PAWNEE FIRE is burning in CAL FIRE’s Sonoma-Lake Napa Unit’s area. This is no longer being managed by the CAL FIRE IMT Type 1 of the COUNTY FIRE, due to being transferred to the local unit today. This fire is burning five miles northeast of Clearlake Oaks in brush and tall grass. Fire behavior has been reduced to minimal fire activity. Evacuation orders are still in effect. 15,185 acres destroyed with 22 structures lost. 96% contained. 543 personnel along with six crews, 10 engines with a cost-to-date of $36,500,000. Fire behavior is said to be minimal but 215 acres have been scorched. Crews have successfully reached a 90% containment status and crews are expecting this fire to reach 100% containment by Sunday, July 8, 2018. 37 personnel are assigned along with two crews and one engine. Two structures have been lost. Fire suppression and containment costs have reached $1,700,000. 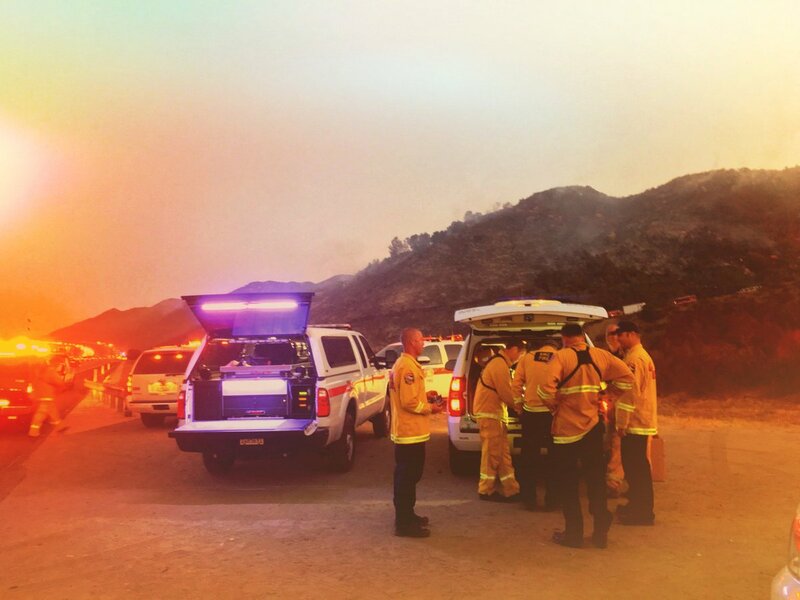 A brush fire prompted fire resources to be dispatched today at 1547 hours to the Sierra Hwy and Mint Canyon Road. This is an open incident with limited information. The TUNJUNGA FIRE is located in the 13000 block of Little Tujunga Canyon Road where SO-41, RD-23 and P5EK1S-0501 and CAPT 310 were dispatched to at 0559 hours this morning. Limited information. The VALLEY FIRE is burning on San Bernardino National Forest lands from an unknown cause on Friday, July 6, 2018 around 0130 hours. 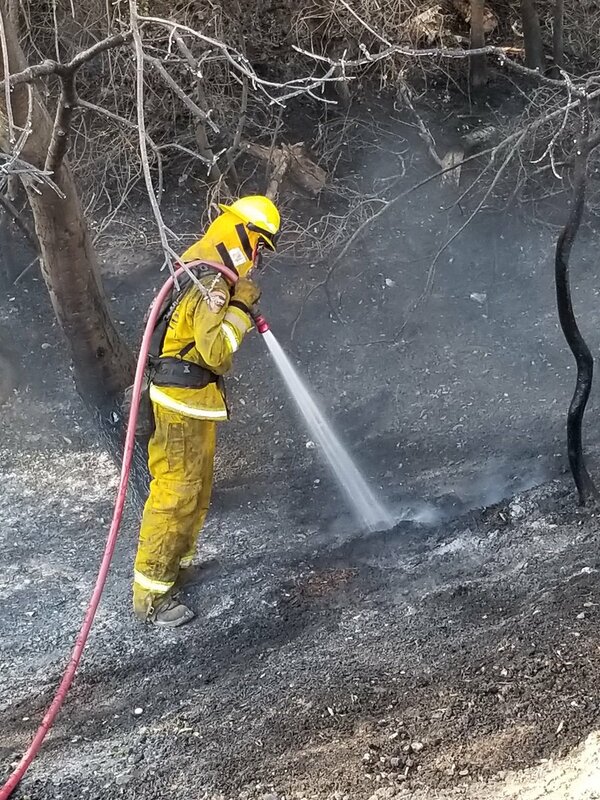 The fire is burning on Hwy 38 at Valley of the Falls Drive and is being managed by a Southern CA IMT 2 which took command of the fire incident as of 1800 hours on Saturday, July 7, 2018. The fire has consumed 1,000 acres of brush and timber, as of tonight’s reporting but crews have successfully reach a 5% containment status. Currently in Unified Command with San Bernardino County SO, San Bernardino County FD, US Forest Service and CAL FIRE – San Bernardino Unit. Evacuations are in effect for the Forest Falls Community area, east of Hwy 38. Structure protection and security resources are in place if the fire reaches this area. No structures have been reported damaged or destroyed from this wildfire. Public Service Announcement —> Devore Animal Shelter – 19777 Shelter Way, San Bernardino. 504 personnel are assigned to this incident along with 39 engines, nine crews, five water tenders, two dozers and nine helicopters. Additional fire suppression and containment resources will continue to arrive on the fire line over the next few days. A TFR is in effect over this fire until further notice. The WEST FIRE is burning on the Cleveland National Forest, off of I-8 and West Willows Rd, about two miles east of Alpine (San Diego County)i n chaparral and tall grass. Fire behavior is extreme and currently threatening the community of Alpine. Evacuations and road closures are in effect. 504 acres have been burned up and crews have reached a 81% containment status. 18 structures have been destroyed. Evacuations are in effect for Suncrest Vista Lane, Highlands View Road, Manzanita View, Olive View, Scenic View Road, Scenic View Place, Pine View, Viejas View Place, Sage View, Oak View Road, Verde View Road, Calle Caleta Viejas and Via La Mancha. 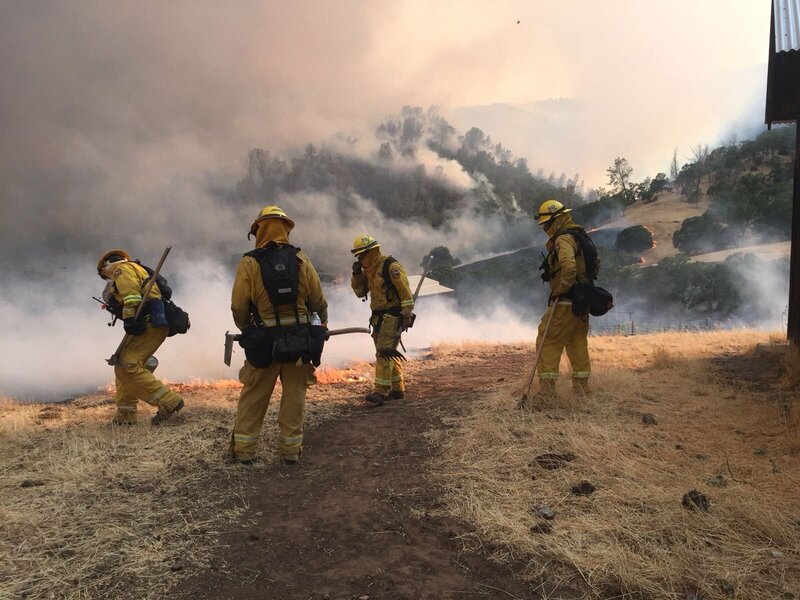 420 personnel from CAL FIRE – San Diego, Alpine Fire District and Cleveland National Forest are assigned along with eight crews, 67 engines and five helicopters. Cost-to-date is $500,000. Fire resources were dispatched today at 1606 this afternoon to the Guffy Campground near the Wrightwood Wash on the east side. PAT 38 (IC) arrived on-scene. Open incident. 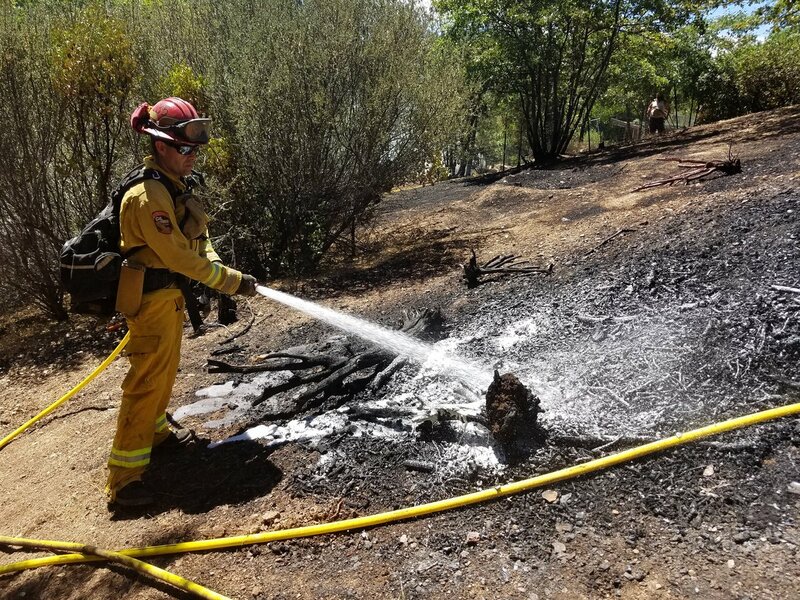 CAL FIRE’s Butte Unit and the Butte County Fire Department were on-scene of a brush fire that broke out on Yankee Vista Circle, where fire crews worked tirelessly to stop the forward progression and holding the damage to a half-of-an-acre. Mop-up operations were on-going around this afternoon at 1450 hours. 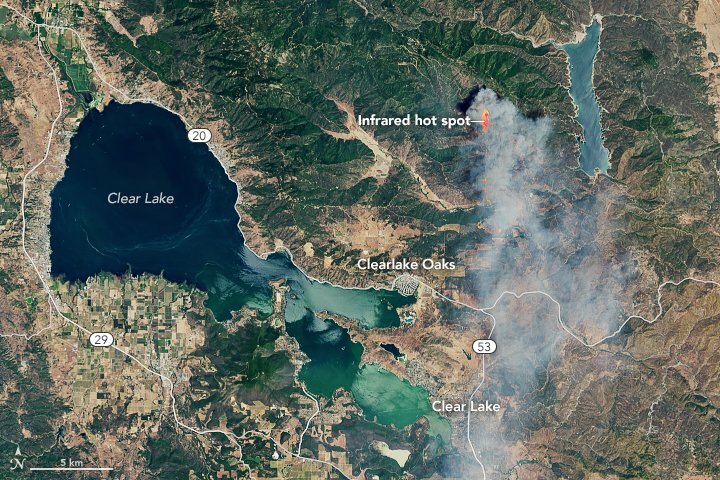 CLEARLAKE OAKS, Calif. – A wildfire that started Saturday, June 23rd was said to be like an out-of-control runaway train or as we may say it more like a Firestorm is starting to become more tame by the day. Firefighters are beginning to make some good progress on containment, but not without a fierce fight and tireless efforts both day and night. Here is the Sit Rep for the North California wildfire called the Pawnee Fire. Unified Command | CAL FIRE, Lake County SO, US Forest Service and Northshore Fire Protection District . Incident Cooperators | Lake Co SO, Lake County OES, CA DOC and Rehab, CA Conservation Corps, BLM, US Forest, CHP, PG&E and Lake Evacuation Animal Protection. 2024 | Hot and windy weather fire conditions are in the forecast. 1904 | 2700 personnel. 235 engines, 58 fire crews, 15 helicopters, numerous air tanker teams through the State (flying as conditions will allow), 69 bulldozers, 25 water tenders. 13,000 acres. 17% containment. 22 structures destroyed. 4 structures damaged. Road Closures: At Hwy 20, the follow roads are closed – Old Long Valley Rd, Walker Ridge, Mule Skinner Rd, Bear Valley Rd; At Brim Road, all roads are closed – Bear Valley Rd and Leesville Lodge Rd. Mandatory Evacuations: Spring Valley Community: entire area including all roads accessed off of Old Long Valley Rd and New Long Valley Rd, north of Hwy 20; Mule Skinner, Long Branch, Watertrough Rd, Flintlock, Muzzleloader, No Guns, Antelope, Cougar, Marianne, Ramrod and Moccasin. Advisory Evacuation Notices: East of Walker Ridge area, Wilbur Springs area, Bear Valley and Brim Road. 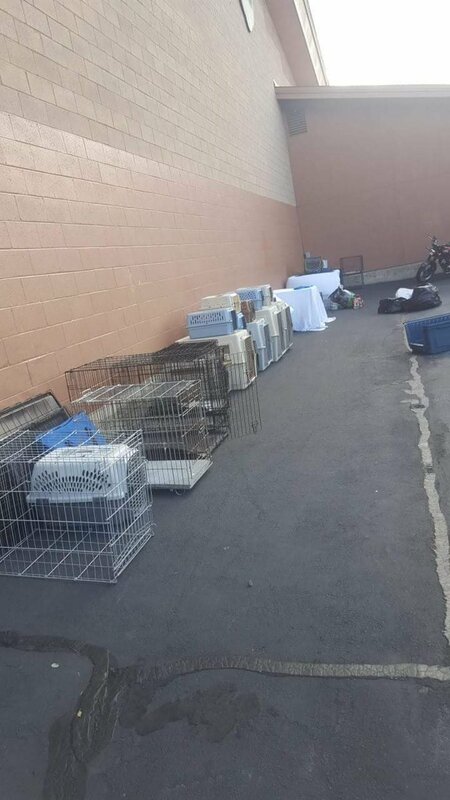 Animal Evacuations: Contact Animal Control at 707-263-0278. 1205 | Fire moving southeast. 1925 | Media began reporting the fire was expected to jump Water Ridge by 1930 hours and head down into Bear Valley. Crews were in the middle of structure protection of a communications repeater (infrastructure). 1852 | CAL FIRE firefighters continue to directly engage in building containment lines and utilizing aerial attack when possible. 1759 | Winds picked up in the Spring Valley area which created unpredictable fire behavior and media was reporting that the fire was so big, it was creating its own weather. This was occurring off of Chalk Mountain Road, which they reported fire crews were working on structure protection. 1615 | A VLAT (For those non-fire speaking folks: this stands for very large airtanker) was observed dropping in front of some CAL FIRE engines while extending the fire-retardant lines. 1522 | Reports of the fire just made a strong run and crews just lost a line. They are hoping the next one holds. 0727 | The fire was located northeast of Clearlake Oaks in Lake County had grown to 8,200 acres. 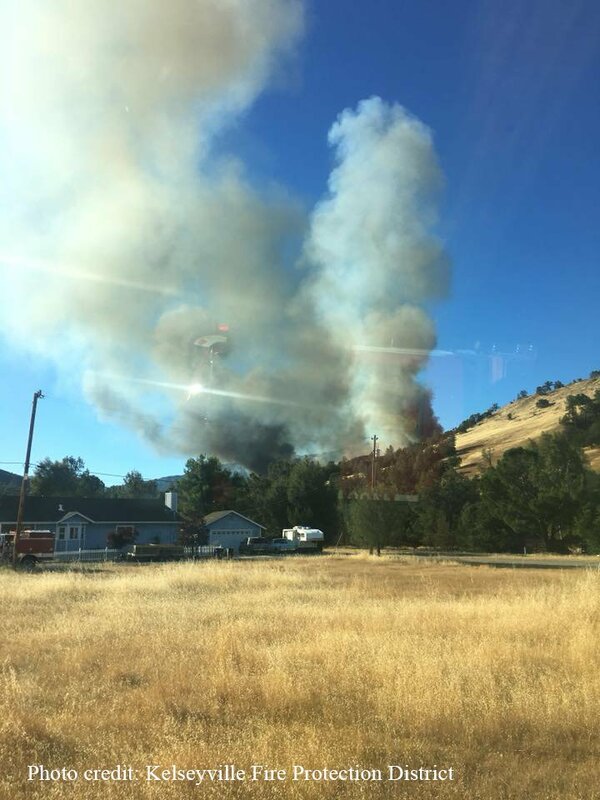 BITTERWATER, Calif. – A fire burning off of Coalinga Road, just east of Bitterwater in San Benito County has consumed 513 acres of land. It is burning in the CAL FIRE – San Benito – Monterey service area. There are 238 personnel assigned to this incident. 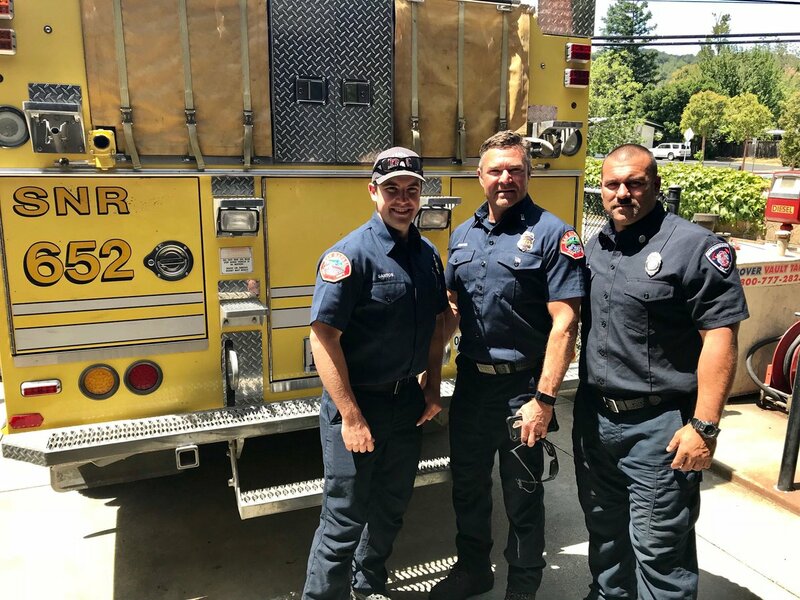 One of the units from San Rafael Fire returned back into their area on Sunday, June 10, 2018. On June 5, 2018, the Incident Commander (IC) ordered 5 air tankers and 4 helicopters for the following day’s fire operations. A 90% containment status has been reached on this fire. 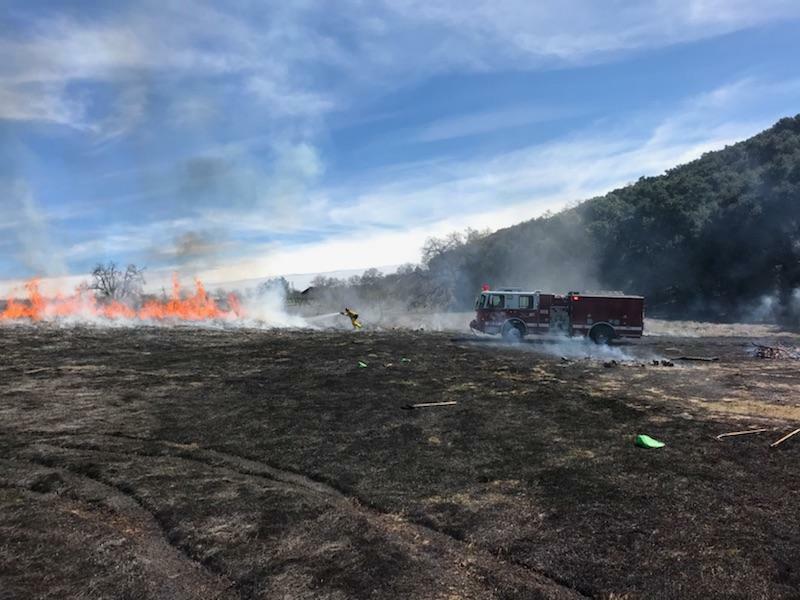 San Luis Obispo County, California | A small brush fire that broke out on Wednesday around 1250 hours PST off of San Rita Road in San Luis Obispo County, California. Size Up | The fire was quickly extinguished by firefighters that stopped its forward progression. The total of acres burned was only three. Firefighters put the fire out and conducted mop-up operations @ 1325 hours – 1525 hours PST. 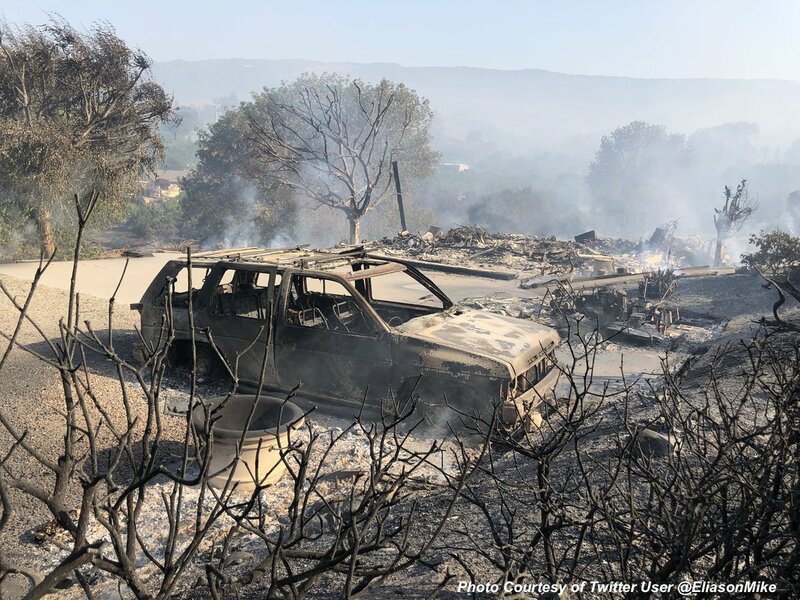 Resources | Firefighters were dispatched from CALFIRE and San Obispo County Fire working in tandem with fire suppression and containment efforts. A vegetation fire has broken out today around 12:30 PM PST in North County San Diego or on I-15 and Gopher Road (California), in a location where other fires have visited before. Today, the fire has consumed about 28 acres but crews have reached a 50% containment status (around 2:50 PM PST). The weather conditions are temps reaching almost up to 90* degrees with winds picking up. 5 homes were being threatened. At one time or another, the I-15 (both directions) and Old Hwy 395 were said to be closed but have reopened. Be alert when driving in the area, as drivers appear to be crashing through freeway barriers and driving the wrong area on the freeway to avoid the extreme heavy traffic. Historical fire activity shows this is one spot fire crews appear to be responding to often, with no end in sight. Due to unknown causes, fire crews are asking the motoring public to be more aware of your surroundings and help with fire prevention. 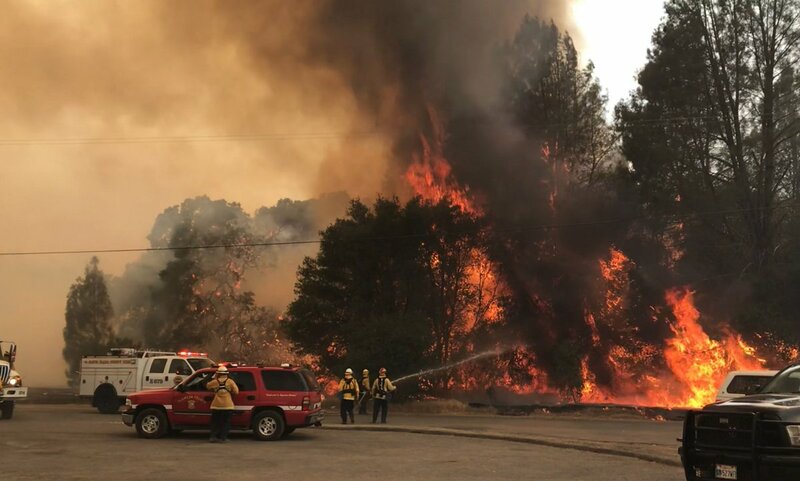 A fire broke out in early August in the I-15 and Gopher Canyon Rd area prompting a large fire response with up to 120 firefighters, air resources, evacuations and diverting traffic away from the freeway fire. 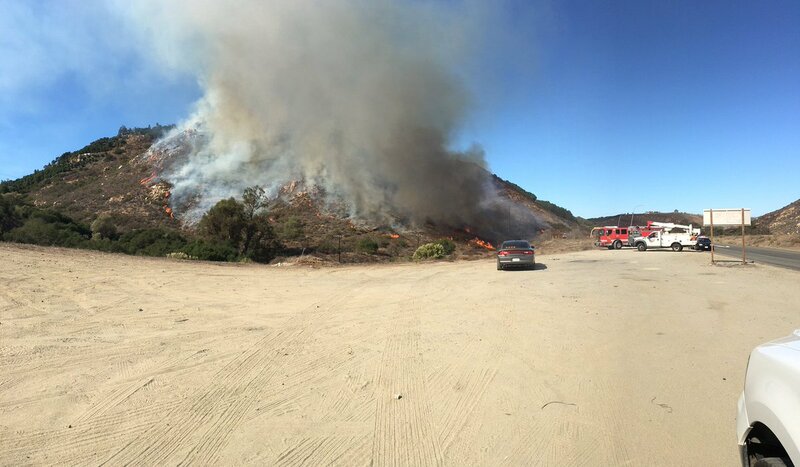 A large wildfire broke out in North County of San Diego in August of 2015, South of SR76 and West of I-15 freeway. A fire ignited from an unknown source in July of 2013 on I-15 and Gopher Canyon Rd. Unknown acreage scorched. The Yucca Fire was reported by a CAL Fire plane flying over the area on Saturday afternoon of November 5th. It was deemed that lightning caused the wildfire to start burning North of Yucca Mountain, at the junction of Yucca Ridge and Pine Ridge in Sequoia National Park, California. Four (4) acres of timber have been consumed due to the quick response and tireless fire suppression efforts by fire crews from the Kings Canyon and Sequoia National Forests. There are no structures that have been effected and there are no evacuation in effect. Fire Photography is Courtesy of Inciweb. The wildfire started on 10/11/2016 @ 1:00 PM PDT. The wildfire is burning in the Sierra National Forest on the Sacata Ridge. North of Pine Flat Reservoir and about 2 miles from Cold Springs Rancheria, California (Fresno County). It is located in a remote area. The fire has reached 1959 acres and a 71% containment status. Fire crews will continue to shore up containment lines. Heavy rain is due to hit the area helping increase the containment status. There are approximately 524 personnel assigned to this fire incident. We are using these hashtags #SacataFire #CaWILDFIRE for the Sacata Fire.